White gold is an alloy of yellow gold and a selection of other metals such as nickel and palladium. It is a popular, precious metal for wedding rings, as it has a number of useful properties. White gold is durable and easy to shape into intricate designs. It is also easy to alter white gold and this means that wedding rings can be adjusted over time if necessary. White gold can also offer a highly polished, modern look that is popular in contemporary markets. It is similar in appearance to another precious metal, platinum, but can be much more affordable. White gold can be given its characteristic white appearance through various different alloys. Nickel was the traditional metal used in white gold. However, many people can experience allergic reactions to nickel. As a result, it is less commonly used these days. Palladium is a rare transition metal (similar to platinum) that has a white appearance. This metal is used in high-quality, white gold alloys. Palladium is the ideal metal to use in white gold wedding rings as it is durable, resistant to yellowing and offers a superior finish. White gold wedding rings containing palladium will be more expensive than the other alloy options. Although white gold is lighter than yellow gold, it still has a slightly yellowish appearance. This is why several different metal plating layers have been added to white gold, over the years. It is done to enhance the brightness and whiteness of this metal alloy. These metal plating techniques do not affect the hallmarks on the piece of jewelry and are exceedingly thin coatings that protect the metal underneath against wear. Rhodium plating creates an extremely bright, glossy finish and is widely used by jewelers for white gold designs. This type of plating is extremely hard. As a result, it will last a long time. However, rhodium plating can wear and scratch over time. Because of the metal employed, it will allow the colour underneath to show through, to the surface. Your white gold wedding ring may need to be re-plated, in the future. This is an easy job for a professional jeweler. Some cheaper rhodium, plated jewelry are a yellow gold alloy, underneath. They are not, at all, white gold. These lower cost rings can quickly wear so that the yellow colour underneath begins to show, which can make rings look old and outdated. Why Choose White Gold Wedding Rings? White gold offers a polished, contemporary look, which is much more popular than traditional yellow gold, in modern wedding ring design. White gold is much cheaper than platinum but provides a remarkably similar finish, so is a cost effective option for those individuals shopping on a budget who still want the latest designs. White gold is, also, easy to use. This means it can be fashioned into a number of different, intricate styles and designs. There is a wide choice of different wedding rings available in white gold to suit most budgets. White gold will combine easily with yellow gold for engaging two-tone designs. However, these two metals can wear at different speeds. It is advisable that you may need parts of the ring refurbished, over time. White gold is suitable for both male and female wedding rings and can also be paired with a white gold engagement ring for a coordinated, contemporary look. The cost of white gold wedding rings can vary depending on the quality and weight of the alloy, the style and also the designer. Because the larger sizes will be heavier, in most cases, the size of your wedding ring will, also, contribute to the price. There is a number of highly cost effective options available with stylish new 14k white gold rings available from as little as $80. You could also opt for even cheaper 9k white gold wedding rings with prices starting from as little as $40. Luxury white gold wedding rings from top designers can cost anywhere from $400 to $1,200, but this is still a cost effective option when you compare it to similar designs in platinum. The size of your wedding ring will be essential to ensure comfort and fit. You should get your ring size measured at professional jewelers. If the ring is too large, it could slip off and be lost. If the ring is too tight, it will be uncomfortable. The result will be that you will not be able to wear it for long periods of time. Many people wear their wedding rings 24/7 so getting the right fit is hugely beneficial. If you purchase white, gold wedding rings, they can be adjusted easily by a jeweler. This means that if your finger size changes over time you can send your ring off for alterations. The shape of a wedding ring is also crucial in terms of fit. Some ring styles create a much looser fit than others. This can mean that rings in the same sizes can offer different fits. A traditional fit ring has flat edges. This means the ring sits directly against the skin. This creates a tighter feeling fit. A comfort fit ring offers a slightly bevelled inside, which means that the edges of the ring will not sit directly against the skin. This creates a looser feel. Therefore, it makes the ring more comfortable. Customers often find that a traditional fit ring in their size feels a bit tight and prefer to choose the comfort fit option instead. It is essential to try on any ring you intend to purchase just to make sure it will be comfortable and well fitting. If you are buying online, then most jewelers offer you the chance to return the ring, within a specific period of time. If it does not fit, the jewelers will change the size for you. However, if, you have ordered a bespoke ring, it will not be possible to, simply, change the size. In this case, you would need to pay to have the ring altered. 9k is represented by the hallmark number 375. The main benefit this karat has is that it is cheaper than 18k but can provide an attractive finish for wedding rings. 9k gold contains 37.5% gold and the addition of other metals gives it a ‘white’ color and also increases its durability. Another benefit of 9k gold is that it does not feel as heavy as 18k gold and so can is a convenient, lightweight option. 18k gold is one of the most popular choices for wedding rings as it combines high-quality purity with durability. 18k gold is represented by the hallmark number 750 and is 75% pure gold. Because of the high-gold content, white 18k gold has a naturally pale yellow colour. This is the reason why nearly all 18k gold jewelry is plated with a white coating such as rhodium. This also helps to give the jewelry more durability. Also, it protects the gold against scratches. There is a number of highly competitive jewelers operating online stores. This can be an extremely cost effective way to buy a white gold wedding ring. An additional advantage is that online catalogs are available 24/7. This means you can browse for your wedding ring whenever you have some free time. Online ordering and delivery is remarkably quick and easy. There are plenty of sizing guides, to make sure you pick the right ring. Online jewelry stores will also offer a returns policy. Make sure you check this first before you make a purchase so that you understand your rights. You can get as much as 40% off high street retail prices at Loveweddingbands.com (www.loveweddingbands.com). There are a wide range of both yellow gold and white gold wedding bands. Free delivery is offered on orders over $100 (in the US) and lifetime breakage guarantees are provided. 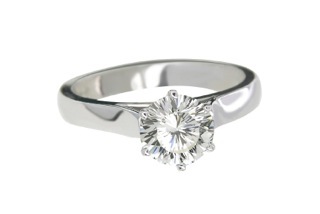 Danforthdiamond.com (www.danforthdiamond.com) also offers some terrific deals on white gold wedding rings. You can get classic designs for under $100. Examples, such as the 14k White Gold 2mm Knife Edge Wedding Band, will sell for prices, starting from $85. There are also some excellent examples of white gold wedding rings available on the second-hand markets. You will need to check carefully for wear and signs of ‘yellowing’. You can have vintage white gold rings re-plated. This means that if you do see the perfect ring then as long as you negotiate the right price you may still be able to get it within budget (even with the re-plating costs). Most jewelers will provide jewelry in white gold. This is a popular metal that is easy to craft. You will find affordable white gold wedding rings from most commercial jewelers. Luxury brands tend to use platinum, rather than white gold. The reason is that it provides a contemporary, polished look, but it is much more hard-wearing. This means that if you want a designer, white gold wedding ring, you may have to approach a top jeweler. You need to ask him to create a bespoke ring, for you. If you wish for a more affordable, mid-range option, then you can find white gold wedding rings, from as little as $80 from leading jewelers such as Reeds Jewelers (retail stores in 18 states), Kays Jewelers (popular US mall store) and Zales.